The Cortina Community has been invited to be a part of the movement to pass immigration reform in the United States. 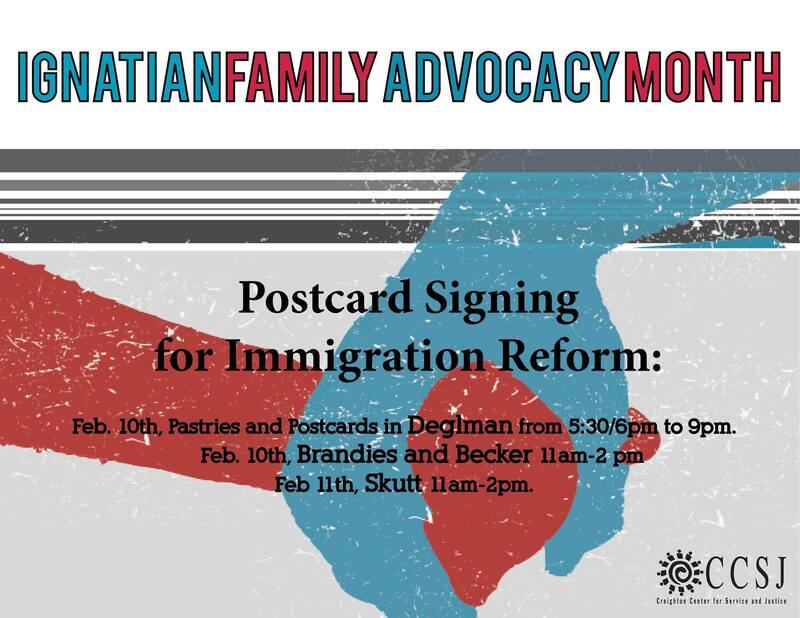 An event called “Pastries and Postcards” will take place on Monday, Feb. 10 in the Deglman lobby from 5:30-8:30 p.m. Students will have the opportunity to sign a postcard for immigration reform and enjoy baked goods from the International Bakery. Additional tabling on campus will occur on Tuesday, Feb. 11 in the Skutt Student Center from 11 a.m. to 2 p.m. All signed postcards from the week will be presented to U.S. Congressman Lee Terry when he visits Creighton’s Center for Service and Justice on Feb. 18 to discuss comprehensive immigration reform with students. The tabling is a part of February’s Ignatian Family Advocacy Month (IFAM). A group of Creighton students attended the Ignatian Family Teach-In for Justice in Washington, D.C. last November, and this month is intended to educate the campus about important social justice issues and continue the conversations with elected officials that were started at the event. Kelly Sullivan, one of the organizers of Pastries and Postcards, explains the importance of needing reform for our country’s immigration system. 1. Families are torn apart: There are ways on paper that allow family members to be united, but backlogs of up to 22 years force families to decide between separation or illegally entering the country. 2. Talent is wasted: Approximately 1.8 million individuals currently residing in the U.S. were brought here at a young age, but their lack of legal status prevents them from reaching their dreams and puts them at risk of deportation to a foreign country. 3. Workers are exploited: Migrant workers are consistently exploited and forced to work in unsafe conditions. 4. Suffering is ignored: Our asylum and refugee system is under threat, and rather than treating these oppressed peoples with compassion, the system treats them as potential terrorists and subjects them to lengthy delays. 5. An increasingly militarized border: The misguided border militarization of the last decade has cost $100 billion, doubled the size of the Border Patrol without sufficient screening, training or accountability, led to over 6,000 dead and murdered immigrants, and allowed widespread civil and human rights violations. Sullivan also emphasizes the importance of acting now. Rep. Lee Terry’s visit to Creighton will allow him to hear what his constituents are asking for and give students the opportunity to have direct interaction and voice their opinions. If you are interested in being a part of the meeting, contact Cat Keating at CatherineKeating@creighton.edu. For more information and resources about immigration, visit the websites below. You can also visit and like the CU for Comprehensive Immigration Reform Facebook page.